This blog decribes the weather and conditions around the country, and focuses on the weather around the Missouri area. 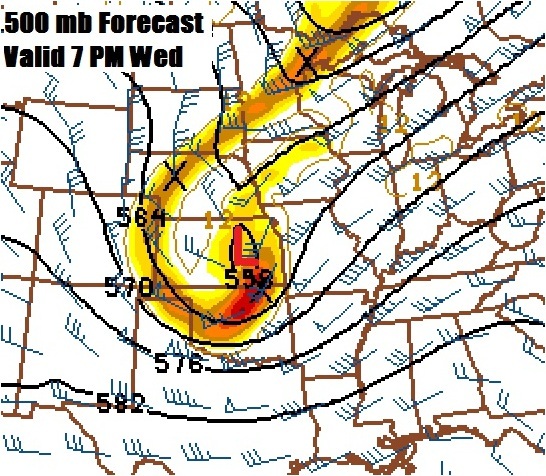 This is the GFS forecast 500mb flow for Wednesday morning. The storm is just beginning to form today, and by Wednesday morning the storm will begin to get its act together in southern Colorado. This will set the stage for a Winter Storm acrossparts of Wyoming, Colorado, the Nebraska Panhandle, and Western Kansas. Numerous Winter Storm Warnings and Watches are currently in place through these areas. over in our area, moisture is being pulled in from the Gulf of Mexico, and as the storm continues to progress and intensify toward us Wednesday, organized areas of rain with embedded thunderstorms will develop during the day. 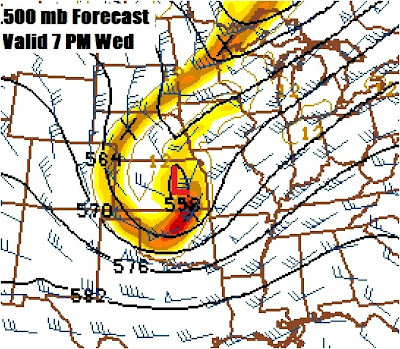 The map above is the 500mb flow around 1 AM Thursday morning as the storm moves toward the state line. As it does so it will likely intensify. 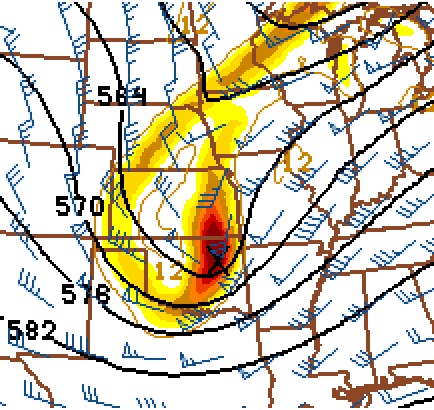 As you can the trough axis with the strong vorticity maximum is working toward the state line. At this time the upper level low is likely about to close off. If it does so, this would lead to an even more organized area of precipitation. But will any of this be snow? The NAM model has been consistently showing it to get cold enough for a change over to snow with some possible light accumulations. The GFS has been consistent in showing now snow for our area. It is still too early to make a prediction on weather it will snow or not, but there is a notable chance for our first snowflakes of the season. Today will be a very nice day. we are on the warm side of the developing storm system, and temperatures should be in the 70's throughout the area. Enjoy it while it lasts, the big change comes tomorrow. Finally something to talk about! It has been a long time since we have been able to talk about some exciting weather. The rainfall for September through October has been extremely dry, with totals in most locations well under an inch. The average precipitation in this time frame is nearly 8 inches! So we are definitely due for some much needed rain. It has been weeks since we have seen any really exciting weather, and for once we are just a few days away from what is the start of a very active pattern. A storm system is forecast to develop in the Rockies and strengthen as it pushes into the Plains. This storm has the potential to bring our area a some very interesting weather. By Thursday morning we could have seen rain eventually mixing with sleet and snow, and possibly changing to all snow. Thunderstorms with gusty winds and small hail are also possible. We will see a warm surge out ahead of the storm on Tuesday, and then a cold surge on the backside of the system. It has been a long time since we have talked about weather this exciting , but lets remember, this storm hasn't even formed yet. You can see the upper level storm intensifying as it approaches Eastern Kansas and Missouri. The track and formation of this storm will be the determining factor as to weather we have a comma head of precipitation develop over our area Wednesday night. For it to get cold enough to snow, we will need some strong lifting and enough cold air to drop temperatures to near 32 degrees. This may very well happen, but the storm will need to take a perfect track. The models have been trending for the storm to take a perfect path and strength for a change over to snow Wednesday evening. 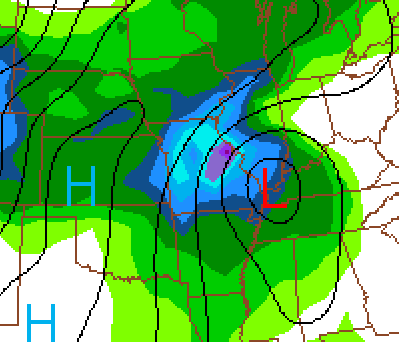 Notice the blue dashed line approaching Northwest Missouri. That is the 540 thickness, which in most storms in one indication that it will be cold enough to snow north and west of this line. This line will be approaching the area around 7 PM Wednesday, and at the same time, we will going through the strongest lifting. But once again, this storm hasn't even formed yet, and there are still a lot of questions as to the strength and track. So lets see how the next few models trend. We really need to break this extremely long dry spell. Will we end up with less than half and inch of rain, or an inch plus and a possible change over to snow? This is just the beginning of a series of storm system in the next 2 weeks. Today should be very nice with light winds and highs in the 60's and approaching 70 degrees near Kansas City. Tuesday should be a great day as we get a surge of warm air in front of the approaching storm system. Highs should make a run in the low to mid 70's. Some locations south of I-70 and near Kansas City may approach 80 degrees. I will have a new entry tomorrow on the approaching storm system. Today will remain cloudy with highs in the upper 70's to low 80's around the area. There is band of rain stretching northward through central Kansas, and some showers and maybe a thunderstorm will be possible by late this afternoon based on the current radar trends. The National Weather Service has locations along and north of I-70 in a Flash Flood Watch. This Flash Flood Watch is in antisipation of possibly some very heavy rain as a strong cold front meets up with a plume of tropical moisture from Mexico. 1-2 inches of rain may fall across parts of northern Missouri tonight as rounds of thunderstorms move through the area. The ground in this area is saturated from recent rounds of heavy rain and thunderstorms, so more flash flooding looks likely. With MLCAPE of 500-750 J/kg, the risk for severe thunderstorms is pretty low as the atmosphere may be too stable, but a few isolated strong to severe thunderstorms may develop. The main risk would be some gusty winds and marginally severe hail. As a result the Storm Prediction Center has a slight risk for severe thunderstorms from Kansas, northeast through Iowa and Michigan. Late tonight the strong cold front will sweep through with a long line of thunderstorms. They should be under severe limits, but a few parts of the line may produce winds gusty enough to become severe. The rain chance should be completely out of the area by Friday morning. Friday should be great with temperatures in the low to mid 70's and no rain. The forecast gets tricky Saturday into Sunday as an upper level low becomes "cut off" and moves south over us Saturday night. The computer models are not consistant on where it will end up tracking, but it looks like it will either be cool and dry, or cool and wet. It will take a couple more days to figure this out. This would definitely be a cool and wet scenario. Lets look back in the past few days. A storm system moved into the area on Saturday, Septemeber 18, 2010 with a cold front stalling out along I-70. The temperature gradient was pretty impressive with around 90 degrees in Kansas City and 40's across Nebraska. Dewpoints south of the front were also near or above 70 degrees. Conditions were very favorable for thunderstorms to form. Around 3:00 PM thunderstorms started lining up right over the Kansas City Metropolitan area, creating a very dangerous situation. With the favorable conditions, they quickly turned severe with damaging winds and hail. The storms were training over the same area so flash flooding was also a concern. What was amazing, was in a couple of the stronger stroms, the updrafts went crazy, and were strong enough to support hail over 5 inches! 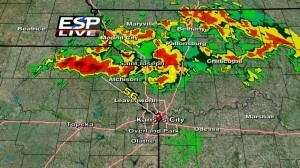 The storms also produced damaging microbursts to add to the damage around Kansas City. The thunderstorms continued around the area into the very early morning hours of Sunday the 19th. Here are some images from the NWS in Pleasant Hill, MO. Yesterday, a weak cold front stalled out across southeast Nebraska. Temperatures were well into the 80's and dewpoints neared 70 degrees. Everything seemed right for thunderstorms to form across southeastern Nebraska, northeast Kansas, and northern Missouri. I expected a Severe Thunderstorm Watch to be issued across northern Missouri by early afternoon and as expected a watch was issued. The threat for severe thunderstorms was pretty slim, and the only reports were in northeast Kansas, but take a look at the radar around 7:40 PM Tuesday. After all that, what is next? Well there is a couple things I am tracking. 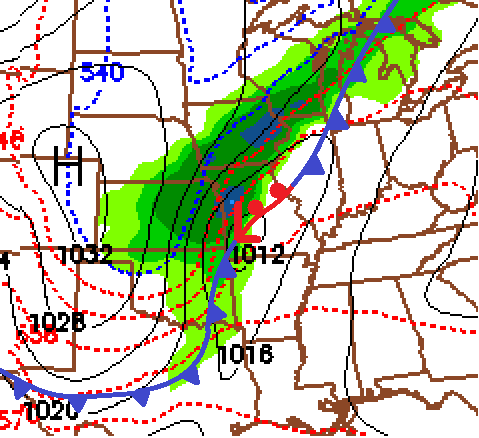 On Thursday a strong cold front will approach the area and push into southern Missouri by Thursday night. 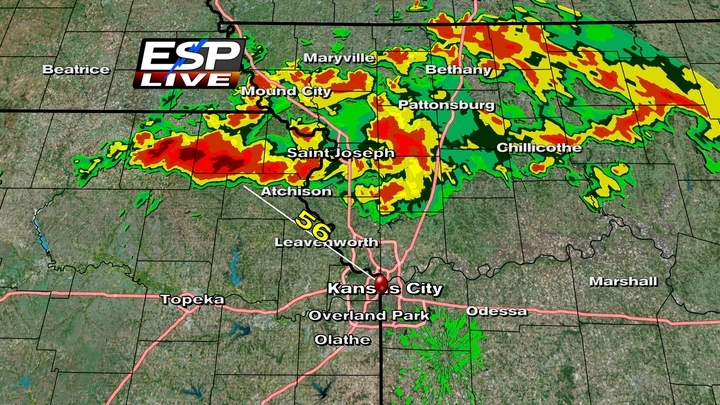 Right now it looks like rain and thunderstorms, heavy at times will push southeast. Some of the thunderstorms may be severe, but more heavy rain looks likely. Friday and during the day on Saturday should be very nice with highs in 70's, but an upper level low is forecast to drop southward right over Missouri by Saturday night. 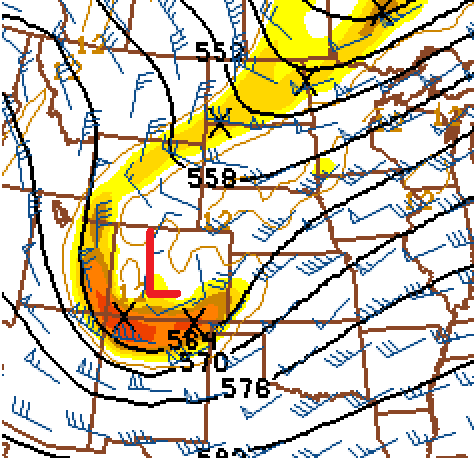 This "Cut off" Upper Level Low will likely create a cool rainy day on Sunday. and lows in northern Missouri could dip into the 40's Monday morning. have a good first day of Fall. The eye of the hurricane is 111 miles south of Brownsville, Texas. The pressure of the hurricane is down to 948, making this a very strong storm even though the winds are only at 100 mph. It appears the most damage/deaths from this storm will be post landfall. The slow movement and abundant moisture will allow for very heavy rains in south Texas and northern Mexico, where flooding is already occurring. The remnants of this system will likely sit over northern Miexico for the next several days. You can see the eye very clearly as the storm nears landfall in Mexico. Around that eye is where the most intense winds are located. This large hurricane is only moving about 12 mph allowing the eye to stay over the Gulf for a bit longer, thus may allow for some continued strengthening. The rains from Alex have already caused flooding from southern Texas into northeastern Mexico where much more is to come with this slow moving hurricane. 6-12 inches is likely in southern Texas. With Hurricane Alex very close to landfall, there shouldnt be much more strengthening of the storm. I think the winds may increase to 105 mph or so, but it remain a category 2 hurricane. We are very lucky this storm wasnt still a day away, because with the dry air and other obstacles out of the way, conditions are very favorable for rapid strengthening. If this storm was still a day away we would likely be dealing with a very large and powerful major hurricane. But a category 2 for the first storm of the season isnt too shabby. Lets look at the history of this storm. Alex formed as a Tropical Depression a ways south and east of the Yucatan Peninsula. It soon developed into a 60 mph Tropical Storm as it moved northwest and made landfall in the western Yucatan. It reamerged in the western Gulf of Mexico as a Tropical Depresion and rapidly intensified into a strong Tropical Storm as it moved nothward. The computer models were forecasting a more westward turn, so it was a waiting game to see when Alex would turn northwest. The storm did finally make the northwest turn which poised it directly toward Brownsville, Texas. The forecast was now for it to turn more westerly and aim Alex’s landfall in northern Mexico. The longer it stayed on the northwest track, the greater the chance of a US lanfall. 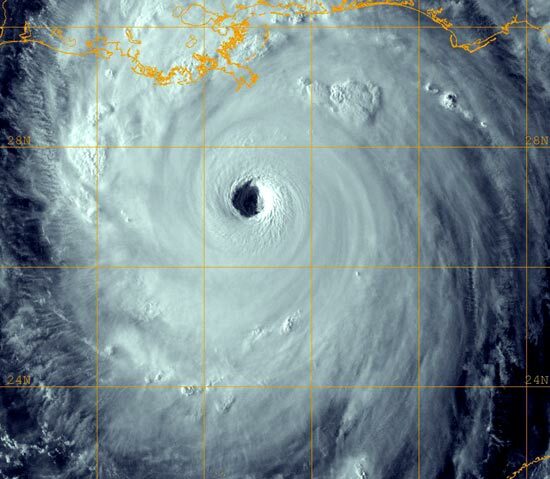 the storm did finally turn west and Alex became the first hurricane of the 2010 season. The storm once again made a turn to the northwest, puting the threat back on the south Texas coast, but it remained south of the US and as mentioned, make landfall as a category 2 storm in northern Mexico. Hurricane Alex will likely bring a storm surge of between 3-9 feet in northern Mexico and south Texas. A few tornadoes are also possible a the atmosphere is moderately unstable with plenty of moisture and wind sheer. Remember the most likely locations for tornadoes will be on the right side of where the storm makes landfall. Another concearn with this Hurricane is the effects it has on the oil disater in the Gulf. Alex is creating rough seas over the Deepwater Horizon blowout location with 6-8 foot waves. The strong winds and rough seas will push oil into many of the bays and esturaries that havnt seen the oil yet. A storm surge of 1-2 feet along the Louisiana coast will allow the oil to press deeper into the very complex and fragile ecosystem of the marshlands. So, why is this season expected to be such an active one? There are several factors that are included, but here are the biggest ones. The surface temperatures of the Caribbean and the Tropical Atlantic are exceptionally warm which will provide the fuel the storms need. Neutral or La Nina conditions are developing in the Tropical Pacific with La Nina becomeing more an more likely. Computer models are also showing a vast number of storms developing and is as well predicting an extremely active season. There have been some extremely active seasons in the past and many of those season had a similar oceanic setup to this seasons’s. Remember, the average number of named storms is 11, with around 6 hurricanes, and two of which becoming major of Category 3 or higher. If this season ends up at the high end of the predicted number of storms, then it will go down as one of the most active seasons on record. With so many tropical systems being predicted, there is increase of U.S. landfall. Anyone who lives along the coast from the Gulf of Mexico, all the way up the east coast needs to be prepared. It is impossible to predict how many storms will make landfall as that lies with atmospheric conditions, but you should have the mindset going into a season that any storms that form pose a threat. Hurricane Katrina, a strong Category 5 hurricane is passing through the current location of the oil slick. If a hurricane decides to take a similar path this season, all of the works and hopes to keep as much oil out of the marshes will be lost. With the oil leak the biggest disaster in years, the last thing we need is a hurricane to track over it as it will create a natural disaster of epic proportions. Many ingredients need to come together from water temperatures to atmospheric conditions, but this season may be one to be remembered. Thunderstorms developed across eastern Kansas and Missouri today (Tuesday) with the heating of the day. Some of these thunderstorms reached severe limits and produced some hail. Ping pong sized hail was reported just east of Smithville, MO. Since these thunderstorms were being powered by the heat, once the evening approached, they began to die. The bigger threat with these thunderstorms today was the heavy rain. There was just about no wind shear, so the storms were moving very very slowly and flash flooding was a concearn. The thunderstorms this afternoon were scattered, but they will be more numerous for Wednesday from Kansas through Missouri and northeastward into Iowa, Illinois, and southern Wisconson. The storms will be developing along the frontal boundary and the thunderstorms will likely not get into anything very organized, but some organizations is possible at time throughout the afternoon and into the evening hours. There is a very slight threat of some of the thunderstorms turning severe, but some of these storms will “pulse” up during the afternoon and become strong to severe with hail the main threat. The thunderstorm threat will diminish by Thursday across the southern Plains and lead to a very pleasent Memorial Day weekend with high temperatures in the 80’s throughout the region. We are experiencing ridging over the Plains which is allowing very warm air to spill into the region. The troughing over the west is keeping the cooler and active weather away from us and will remain in place through next week. Temperatures this afternoon will warm into the mid to upper 80's with dewpoints in the upper 60's and low 70's, creating very humid conditions with all of the recent rains. There may be some pop up showers across northern Kansas and Missouri, but they should diminish by noon. There will likely be a slight chance of an aftrnoon pop up shower or thunderstorm everyday through this next week. There have already been 13 tornado reports and there will be more to come with the possibility of large tornadoes forming. The severe and tornadic threat will continue into the overnight hours and this will make for a dangerous situation as tornadoes are hard to see at night and most people are asleep. These intense supercells are also containing very large hail and damaging winds. This event is just starting ramp up so stay tuned to your weather radio and the NWS (National Weather Service) for the latest warnings. Thunderstorms will form along the dryline and rapidliy become supercellular. There will likely be numerous tornadoes and a few of them may be quite strong. Remember, last Monday, there were 2 EF-4 tornadoes that tracked through the southern Oklahoma City area affecting the towns of Moore and Norman, OK. This could be a scenario again today, so people need to pay close attention to any warnings issued. Along with the tornadic threat, the stronger cells will likely contain hail up to baseball+ and damaging winds. The severe threat will shift into eastern Oklahoma this evening and possibly evolve into a MCS (Mesoscale Convective System) and track into Missouri. This will be our second round of rain and will likely be heavy. There really isnt a severe thunderstorm threat in Missouri today or tonight, but 1-2 inches of rain will fall and there could be localized areas of 4+ inches leading to flooding. I will have a new entry late tonight. A severe weather outbreak is likely Wednesday afternoon across Oklahoma with tornadoes, very large hail, and damaging winds. The severe threat will shift into eastern Oklahoma Wednesday evening and the precipitation may form into an MSC (Mesoscale Convective System) and track northeast into Missouri where a flooding threat may occur with heavy rainfall. I will have a new entry in the morning with the latest developments. An area of rain expanded in coverage across eastern Kansas and Missouri this morning and lingered around all day. Totals were not impressive with around half an inch to areas just to the southwest of Kansas City. The southern extent of the rain is currently in northern and north central Missouri and most areas will remain dry overnight, but there could be some drizzle and scattered showers. A disturbence in eastern Oklahoma will cause another area of rain to develop to the south and west in southern Missouri and Kansas that will lift north and east. Rain totals will generally be less than half an inch, with southwestern Missouri maybe with closer to an inch of rain. The morning may be the only dry hours for most locations tomorrow. Highsfor your Sunday will be in the mid to upper 50's from Kansas City northward with low to mid 60's to the south. The SPC still has the area under a slight risk for severe thunderstorms with damaging winds being the main threats. The biggest threat with this system is the very heavy rainfall. With the the slow progression of the storm and frontal boundaries and the heavy precipitaion riding northeast along it, a training effect is occurring. This is leading to excessive rainfall from southeast Kansas northeastward through Missouri. There may be localized areas with over 3 inches of rain tonight. There are many Flood Watches and Warning currently across Missouri due the rain tongiht on the already saturated ground. By Thursday, the rain and thunderstorms should shift from Illinois southwest through Arkansas. With all of the rain recently, you probably dont want to hear about another wet storm sytem for this weekend. I will have an update Thursday morning. As you can see in the map above there is another small Tornado Watch just to right of the Kansas watch. This small watch box includes the Kansas City metro area. Thunderstorms will likely continue to develop in eastern Kansas out ahead of the main line with hail the main threat in any severe thunderstorms. There is a small chance an isolated tonado may spin up, but it really isnt worth mentioning, just that there is a small risk for a tornado. The best chance for a tornado will liekly be in western Oklahoma and south central Kasnas. The biggest threat from this system is looking like the flooding potential. Moisture is streaming in from the southwest and with heavy thunderstorms along a slow moving cold front, flooding rains are likely in spots, especially in far eastern Kansas and through Missouri where nearly the entire state is under a Flood Watch. The cold front will slowly slide into Missouri tonight with heavy thunderstorms in a line along it. The storms, some strong or severe will ride along the front, moving northeast and training over the same areas. Some spots will see excessive rainfall from this. This system has the potential to produce much more that what it is now, but there are limiting factors and I mentioned one in the last blog. Large hail looks to be the main threat from thunderstorms through the overnight hours with excessive rainfall the main threat with a "training" nature of the storms. I will have an update around 1 AM.